I am often asked to evaluate the swings of baseball and softball hitters by analyzing hitting videos. I use a video analysis app developed by Ubersense, which allows me to break down swings in super slow-motion. When I review my findings with players and their parents, I can use drawing tools to illustrate areas that need improvement. No matter how good the hitters are in the videos, I always have some thoughts on adjustments that will increase the hitter’s bat speed and consistency. Once in a while, I will receive a still picture of a hitter that is as easy to analyze as a video of the entire swing. I was immediately struck by how balanced she is after making contact with the ball. In order for her to achieve this balance in the middle of her violent swing, she surely was balanced from the time she set up in the batter’s box to the point when the picture was taken. This included staying in balance during her “load”, the rotation of her lower body, and ultimately the rotation of her upper body, before making contact with the ball. Maintaining balance throughout the swing is a sign of a great hitter. It is also important to note that Allie is not hunched over the plate like so many hitters, nor is her body angled toward first base. Her posture is upright and her head his is in a good position, looking directly at the pitcher. As I have written previously, many softball hitters have a tendency to begin leaning toward first base soon after making contact with the ball. Hitters who do this actually begin losing bat speed before making contact with the ball, because they pull off the pitch as they rush too quickly out of the batter’s box. This is not the case with Allie. Her balanced position leads me to believe she will finish the swing powerfully before making a move to first base, without losing any valuable bat speed. By just looking at the picture, I can tell exactly how Allie generates her power. She is in a classic hitting position, with her front leg perfectly stiff and her back leg bent. This is indicative of an effectively weight transfer from back to front. Like all great hitters, Allie’s front leg serves as a barrier for the power she generates by her weight transfer. At the moment of impact, this barrier allows her to create the proper leverage against her front leg in order to drive the ball with power. Another clue that Allie uses leverage to hit with power is the angle of her shoulders. Notice how her left shoulder is slightly lower than her right shoulder. As I have written before, this is the proper swing angle for power hitters. I have found that the swing angles of young softball hitters are typically flat, because they try to generate power with only their upper bodies. This results in too many weak ground balls. 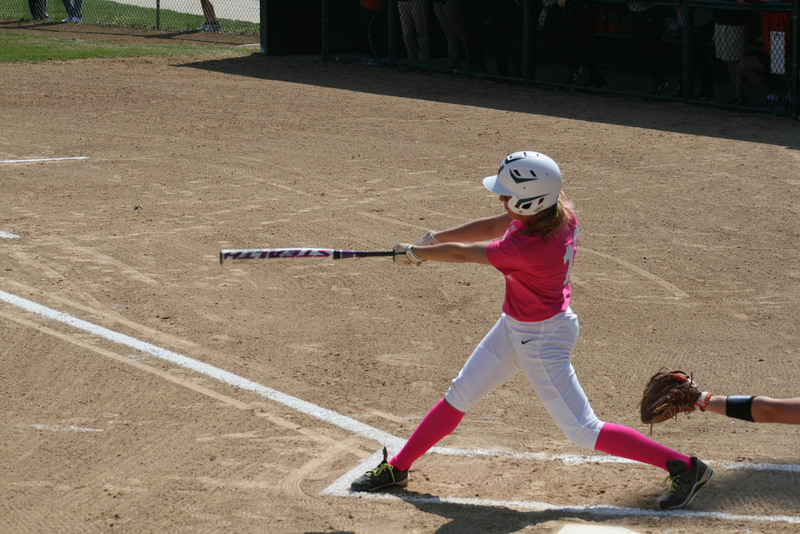 Hitters like Allie who use their lower bodies to generate bat speed find it easier to achieve the correct swing angle that will drive balls into the gaps and occasionally, over the fence. 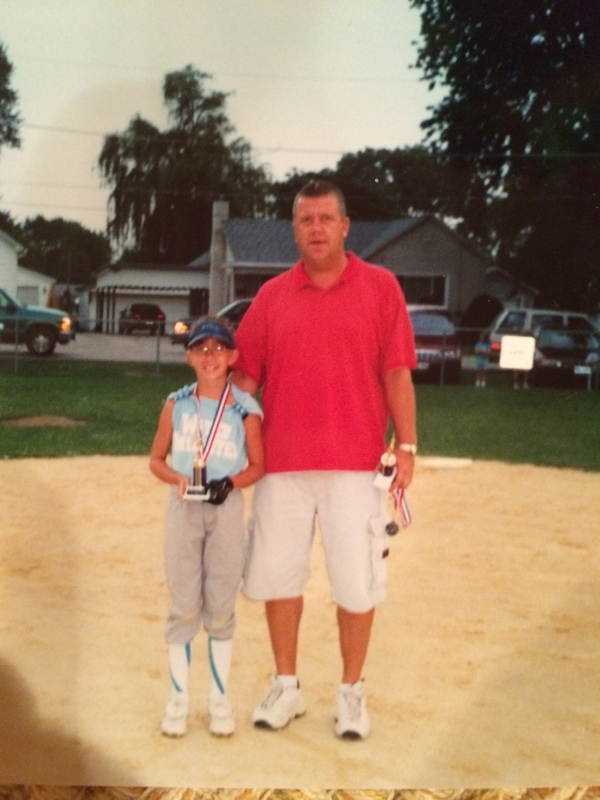 Allie’s father, Jim Riordan, told me her home run in this picture was one of the longest she had ever hit. I wasn’t surprised after marveling at her extension. Whether she achieved full extension at impact or slightly before hitting the ball is not important. Looking at the picture, I can almost feel and hear the moment her bat collided with the ball. It is obvious that Allie really put a “charge” into the ball. I compare this powerful moment of impact to a bolt of lightning, except Allie’s lightning doesn’t come from the sky. It comes from the energy she captures from the ground and transfers kinetically through her body and into the ball. I wish more softball hitters would recognize the connection between extension and power. I also have a good idea how Allie finished the swing. I envision Allie’s finish to be high and away from her body. I base this solely on her balance, leverage, swing angle, and extension in the picture. Finishing the swing properly is one of the most underrated keys to hitting. It is imperative to maintain bat speed from start to finish. Hitters who manually alter the path of the bat with their arms or wrists will lose precious bat speed, even before the ball hits the bat. Allie’s leverage and swing angle convinces me that her bat will not only finish on the right path, it will finish powerfully, without any unnecessary intervention on her part. Here is why the title of this post is “Picture Perfect Swing”. I know that no swing is perfect, including Allie’s. 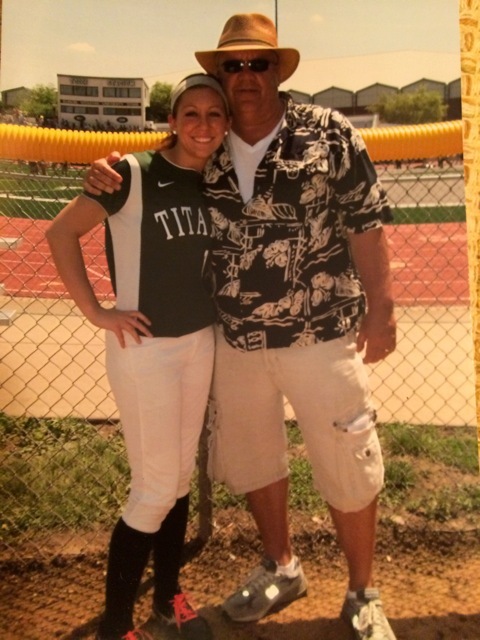 What makes her swing “perfect” is all the time she spent working with her lifetime hitting coach—-her father. What undoubtedly began as an awkward, youthful swing, has been molded over the years into a smooth, mature, and powerful swing. In between, I’m sure there were times of frustration, many tears, and hilarious laughter, as this father-daughter team worked hard to achieve that elusive “perfect swing”. I am also sure Jim and Allie can both look at the picture and remember how they worked together to perfect each aspect of her swing.